From the minute mom and dad arrived to our newborn studio in Los Angeles, it was easy to see how smitten they were with their new little love! 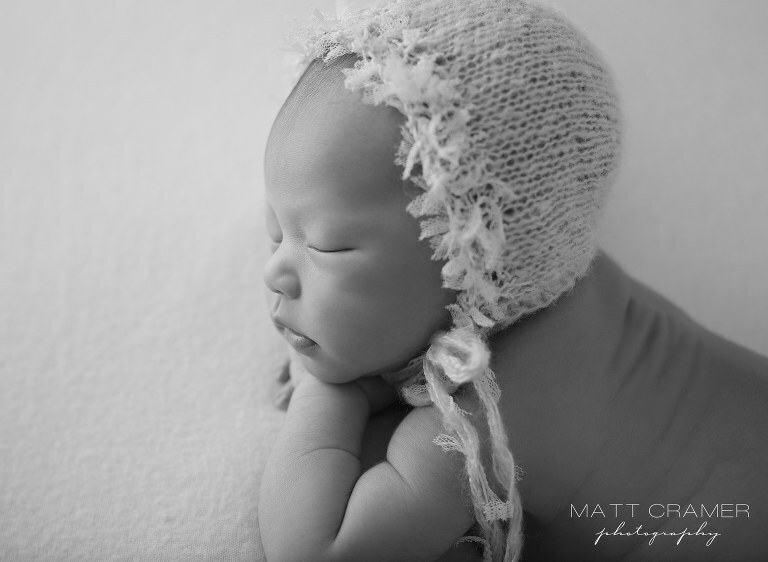 She was a little angel for her Los Angeles newborn photography session with us! What a super chill girl she was! For all her set ups, we focused on using bonnets as accessories. Since mom noted these as a preference in her pre-session questionnaire. So, bonnets it was! 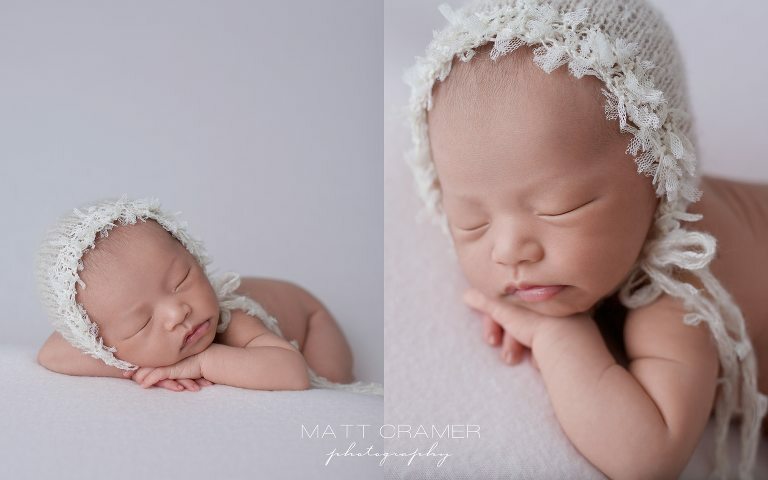 Here are a few favorites from her newborn baby photo session with us. First, we started off with bare baby shots on a clean fabric, capturing multiple angles. We caught a little smirk! Love how this little fringe bonnet framed her face so nicely. Side profile shots are always a parent favorite. Especially dynamic in black and white! Adjusted her pose and added matching wrap! So delicate! Aerial shots are so impactful, we love shooting them. 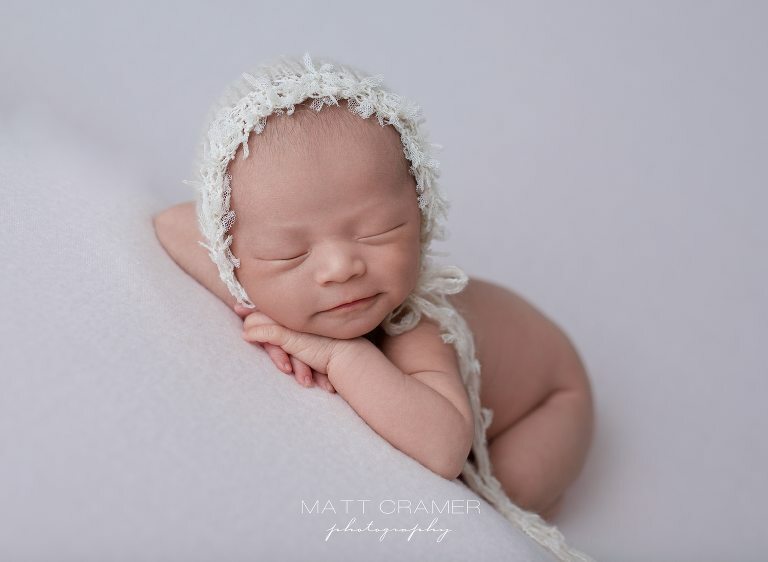 Switched her bonnet for a hand knit style custom made for our newborn photography studio in Los Angeles. Sweet dreams little one! Details are so important! We make sure to capture these in every session! Draped a soft pink textured cheesecloth wrap from Cloth Apothecary– one of our favorites! After the fabric shots, we moved on to our prop shots. This wood bed is always a parent favorite! Next we changed to a light peach set up- so cute! Monochromatic set ups are really beautiful. One more shot of those ten perfect toes. Dreamy smile! This vintage wood bowl is our #1 used prop! After her peach set up, we switched things up to a super soft and light feel. Cream and blush look so angelic on her. This twine wrapped basket prop against the cream texture and lighter wood floor worked perfectly. One of our favorite shots from the entire session. So peaceful with all that soft texture. Winner! Wrapping up the session, we went for a more girly pink look. In addition, we topped it with a vintage inspired bonnet! What a wonderful session with a gorgeous baby girl. So happy to capture such beautiful images and memories for this sweet family.